Thanks to the presence of water and a large variety of plants, there are about 200 bird species that can be found at Hueco Tanks. 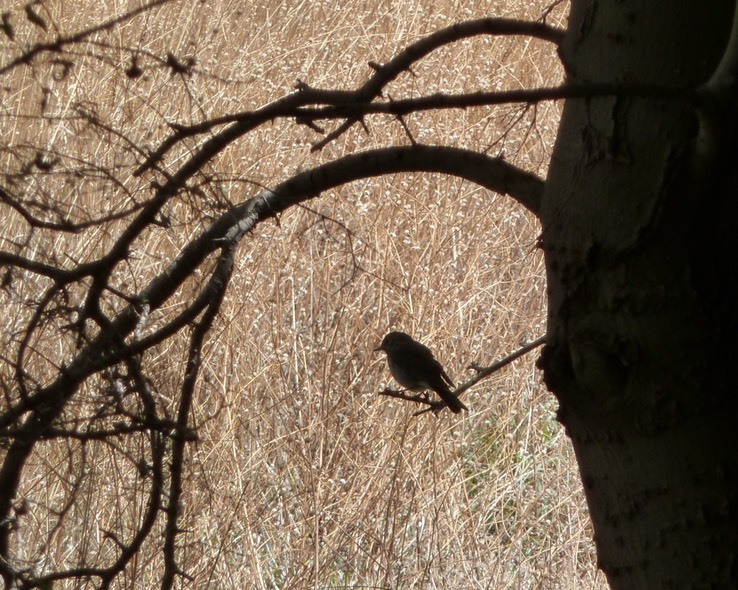 The photo above is the silhouette of a hermit thrush. Hueco Tanks is a mecca for birders, due to the amazing variety of birds which can be seen at the park. Many live there all year, some are in the area for the breeding season, and still others stop over during their semi-annual migration along the Rocky Mountain flyway. There are many, many songbirds, including warblers, towhees, thrashers and wrens. There are many raptors such as golden eagles, northern harriers and owls. At this park one can go on a bird walk looking for the many possible species of birds. Sometimes one can relax and watch just one. We did that with a red-naped sapsucker, and also with a canyon towhee. The birds aren’t particularly afraid of people, so if you are reasonably still and quiet, they will just go about their business as you watch. The bird that most requires the observer to be still, is the Scaled Quail, which is usually seen in sizable groups called ‘coveys’. The photo below was taken on North Mountain while we were climbing up to Cave Kiva. The other type of quail that is seen (and heard) in the park is the Gambel’s Quail. Every so often one can see the totally unexpected. One day we were sitting up on the mountain overlooking Laguna Prieta - after a really good rain - and saw what we thought might be a Kingfisher perched overlooking the “instant lake” formed from the rainwater. It turned out to be just that. The Kingfisher we saw was a male. One of the rangers saw a female later in the day. Kingfishers are rare in the park. They are not exactly a bird one would expect to see in the desert, so it was a fun sighting. And we had a second sighting of a male Belted Kingfisher in April 2015 in Mescalero Canyon. Many birds migrate through the area, and many others stay for the winter. One of the winter residents we’ve encountered is a Lark Bunting, pictured in the photo album. This is a male bird wearing his non-breeding plumage, sighted in mid-October. Perhaps the most amazing bird sighting we’ve had was the Great Blue Heron, sitting on a rock at the top of North Mountain. This species has been seen in the park, but it is considered an ‘accidental species’, one that is sighted only once or twice in any five year period. Perhaps even more than the Kingfisher, this is a bird you just don’t expect to see in the desert, even at an oasis like Hueco Tanks. There are photos of additional kinds of birds in the photo album. Including, as of May 2, 2015, a Greater Roadrunner! We had the pleasure of watching two of them in the campground and they hung around long enough that we were able to get some photos. 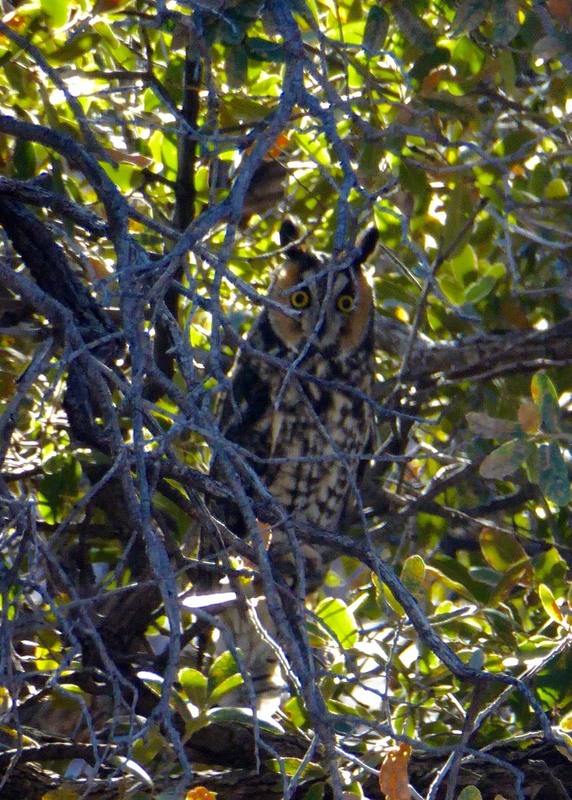 Another coup, after only three years of trying: we finally saw the Long-eared Owls that hang out in the campground (December 3, 2015).